More importantly, an end to “recession,” as economists define it, doesn’t mean much. It doesn’t mean that the economy has returned to normal, or that the financial system in is good shape, or that the outlook for the future is favorable, or that economic activity has made up the ground it lost during the recession. It means only that economic activity has stopped falling and is now rising––to some degree. In some countries, GDP has indeed surpassed pre-crisis levels. In the U.S., GDP in 2013 was 6.0% higher than in 2007; in Germany, it was 4.2% higher; in Japan, it was 0.8% higher; and in France, it was 0.7% higher. But GDP remained 1.7% below the 2007 level in the UK; 6.0% below in Spain; and 8.6% below in Italy. To get a sense of how sluggish the recovery from the Great Recession has been, consider the clearest “success story” among these economies, the U.S. In contrast to the Eurozone economies, its financial crisis came to an end four or five years ago, and the austerity policies that have hampered economic growth in Europe have not been imposed in the U.S. On the contrary, its fiscal policy has been wildly expansionary. Between the end of 2007, when the U.S. recession began, and the end of 2013, its public debt rose by $8.1 trillion, or 88%, or about $4400 per person, per year, for six years. Some of the additional debt has funded additional government spending, while the rest has covered reductions in taxes that have boosted personal consumption and other private spending. U.S. monetary policy has been wildly expansionary as well. The federal funds (interbank overnight) interest rate has averaged 0.14% during the last five years, and the three rounds of quantitative easing by the Federal Reserve have caused its balance sheet (essentially, its holdings of securities) to balloon from $867 billion to $4007 billion, a 362% rise, since the Panic of September 2008. Yet, despite relatively favorable financial conditions in the U.S. and its government’s expansionary policies, the 6% rise in U.S. GDP since 2007 is paltry by historical standards. If the U.S. economy had grown during the last six years at the average rate at which it grew during the two decades preceding the Great Recession, its GDP would have risen more than three times as rapidly. In 2013, the output gap­­––the amount by which actual GDP fell short of this continuing-trend GDP––was a whopping 11.3%. The growth that has occurred in the U.S. has been too meager to put a dent in its joblessness crisis. As the graph below shows, the percentage of adults who are employed, which fell from 63.4% in December 2006 to 58.6% in November 2009, has not increased at all during the last four years. The share of people with jobs is 7.6% below its level seven years earlier, or 10.0% below if we factor out part-time employees who want a full-time job. It is true that the official unemployment rate has declined substantially. 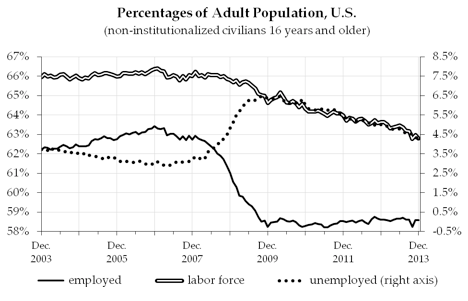 Yet as the graph illustrates, all of the decline is due to unemployed workers dropping out of the labor force; none is due to employment growth. The decline in the U.S. employment-population ratio is so deep and protracted that, even if employment were to increase from now on at twice the pace as which it has increased during the last four years––something no one expects––it would take until mid-2020 for the employment-population ratio to return to its level of seven years ago. If employment grows 50% faster than it has, a possibility that is more realistic but still unlikely in my view, it would take until 2029 for the employment-population ratio to fully recover. Most of the other large advanced countries have output gaps similar to or larger than that of the U.S. As of 2013, the output gap was 10.4% in France, 16.2% in Italy, 19.2% in the UK, and 22.3% in Spain. In Germany and Japan, the output gaps were smaller, 4.8% and 6.2% respectively, but that is largely because GDP growth in these countries was weak even prior to the Great Recession. When Will the Economy Return to Normal? Thus, it is relatively unimportant whether the European and U.S. economies are growing a bit instead of contracting. A bit of growth is far too little to reverse the accumulated devastation of the last six years. The crucial question is: when will the economy return to normal, or even to sustained growth that is strong enough to restore normalcy in due time? A growing number of mainstream economists and economics writers, including New York Times columnist Paul Krugman, Financial Times columnist Martin Wolf, and former U.S. Treasury Secretary Lawrence Summers, have become worried that such a moment may be decades away. Five days before the president of the European Commission declared that the EU’s modest GDP growth represented a “turning point,” Summers spoke at an International Monetary Fund conference and warned that “secular stagnation” is a distinct possibility. Since that speech, the secular stagnation scenario has become a hot topic, if not the hot topic, among macroeconomists. One main argument in favor of the secular stagnation hypothesis is the one I emphasized above: the U.S. economy remains mired in a state of near-stagnation even though its financial crisis is long behind it and its fiscal and monetary policies have been exceptionally expansionary for years. Another argument is that this is not just a post-financial crisis or post-Great Recession problem. As I have discussed elsewhere, the U.S. economy failed to rebound strongly after the dot-com bubble burst in 2000. Ben Bernanke warned that it might experience deflation and a Japanese-style “lost decade” of stagnation, and the Federal Reserve responded with an exceptionally expansionary monetary policy; the real (inflation-adjusted) federal funds rate was negative from the start of 2002 through mid-2005. This policy, and the loosening of credit standards, served to prolong and further inflate the U.S. home-price bubble, and commercial real estate and share prices shot up rapidly as well. Yet in contrast to what took place in the 1990s, skyrocketing asset prices failed to create boom conditions, even temporarily, in the rest of the economy. If one accepts that this analysis is probably correct, the question becomes: why has stagnation become the economy’s default state? Various answers have been put forward. The one that seems most plausible to me is that the economy tends toward stagnation because demand is weak; demand is weak because productive investment demand—spending on equipment, office and factory construction, etc.—has taken a nosedive (see the graph below); and investment has taken a nosedive because the profitability of such investment has become chronically low. In other words, there is insufficient existing profit to fund investment projects, and the future profit they are expected to generate is insufficient to induce the needed volume of investment as well. My analysis, based on official government data, indicates that U.S. corporations’ rate of return on investment in fixed assets fell substantially between the mid-1950s and the early 1980s, and then failed to rebound in a sustained manner for the next quarter-century. Depending on how profit is measured, it either fluctuated around the early-1980s’ low point or continued to trend downward. Summers characterizes the situation differently, as one in which high levels of output and employment can be sustained only if real (i.e., inflation-adjusted) short-term interest rates are significantly below zero. He puts it that way in order to suggest that conventional monetary policy has become ineffective. Yet my analysis is consistent with his, since, if there is now a chronic tendency for productive investment demand to be very weak, interest rates would have to fall to exceedingly and perhaps impossibly low levels in order to induce a volume of investment sufficient to achieve high levels of output and employment. Andrew Kliman is a professor of economics at Pace University in New York. He is the author of The Failure of Capitalist Production: Underlying Causes of the Great Recession (Pluto Books, 2012) andReclaiming Marx’s “Capital”: A Refutation of the Myth of Inconsistency (Lexington Books, 2007). He is also the editor of the new Lexington Books series ‘Heterodox Studies in the Critique of Political Economy’. Many of his writings and talks on the economic crisis are available on his website, and on With Sober Senses. This article was reproduced from the original article here under the Creative Commons Licence. This conclusion is based on GDP data (see note 4, below) and, in the case of the U.S., a variety of other regularly-reported growth indicators. “Autumn Statement: George Osborne says austerity plan is working,” BBC News, Dec. 5, 2013. http://www.bbc.co.uk/news/uk-politics-25225532. The GDP data discussed in this article come from Eurostat, http://epp.eurostat.ec.europa.eu/portal/page/portal/national_accounts/data/database, except those for the U.S., which come from the Bureau of Economic Analysis, http://bea.gov/national/index.htm#gdp. They refer to real GDP, denominated in constant euros, except for the U.S. data, which are denominated in constant dollars. U.S. GDP for 2013 is my estimate, based on data through the third quarter and the assumption that fourth-quarter growth (at an annual rate) was 3.0%. Source: Trading Economics website, http://www.tradingeconomics.com/euro-area/unemployment-rate. In 2012, these seven countries produced almost half of the world’s GDP (real GDP, denominated in U.S. dollars) and more than two-thirds of the GDP produced in countries classified as “high income” by the World Bank. Source: World Bank, World Development Indicators, http://databank.worldbank.org/data/databases.aspx. Source: Board of Governors of the Federal Reserve System, http://www.federalreserve.gov/datadownload/, series H.15 and H.4.1. The data come from Table A-1 of the Bureau of Labor Statistics’ Employment Situation release, http://bls.gov/news.release/empsit.toc.htm. Because annual data for post-reunification Germany begin with 1991, I used the trend GDP growth rate between 1991 and 2007, rather than between 1987 and 2007, to compute these countries’ output gaps. His (edited) text is available at http://larrysummers.com/imf-fourteenth-annual-research-conference-in-honor-of-stanley-fischer/. Andrew Kliman, The Failure of Capitalist Production: Underlying Causes of the Great Recession. London: Pluto Books, 2012, chap. 3. Ben S. Bernanke, “Deflation: Making Sure ‘It’ Doesn’t Happen Here,” remarks before the National Economists Club, Washington, D.C., Nov. 21, 2002. Available at http://www.federalreserve.gov/BOARDDOCS/SPEECHES/2002/20021121/default.htm. After-tax profits are reported by the Bureau of Economic Analysis (BEA), in National Income and Product Account Table 1.14, line 13. Available at http://bea.gov/national/index.htm#gdp. Net investment in fixed assets is the difference between investment and current-cost depreciation, reported by the BEA in Fixed Asset Tables 6.7, line 2 and 6.4, line 2, respectively. Available at http://bea.gov/iTable/index_FA.cfm. Investment and depreciation data for 2013 have not yet been published. The Failure of Capitalist Production, op. cit., chap. 5. Excellent article from Andrew. At root the on-going crisis has been caused by over-accumulation manifested as a low rate of profit.